Amplivox Wireless Portale Media Player PA System SW275. Get the portable PA system that's lightweight, yet packs plenty of power: The Amplivox SW725 wireless portable media player PA system. Weighs less than 12 lb., it gives you the convenience of wireless microphone and receiver, and a Bluetooth-enabled media player with remote. It's 36W amplifier and 6" full-range speaker will let you reach up to 500 people outdoors or in rooms up to 2500 sq. ft. The 16 channel wireless receiver and hand-held wireless mic give you the freedom to move wherever you want during your presentation. The media player takes input from SD cards, thumbdrives, or wirelessly from your Bluetooth devices. The remote gives you complete flexibility to control music or other audio from where you're standing. The SW725 gives you a full range of features including RCA input, output, or other audio devices, external speaker jack, wired mic jack with microphone control, microphone voice priority switch, and tone and echo controls. The unit runs up to 6 hours on rechargeable battery or on AC power. It features a one year warranty and ships complete with wireless handheld mic, wired handheld mic, remote control, RCA cable, AC power cord, and a protective cover with pockets that slips easily over the unit. Put more power in your presentations with the Amplivox SW725. 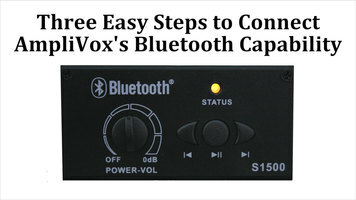 Extend your voice with Amplivox. For easy and excellent sound quality in a compact unit, try the AmpliVox SW725 Wireless Portable PA. 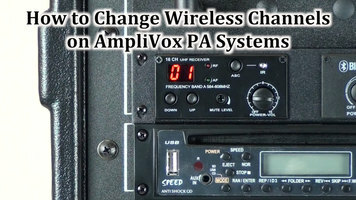 Check out this video to learn how to set up and change channels on an Amplivox PA System. Stream audio from any Bluetooth enabled device in seconds with this Amplivox PA system. 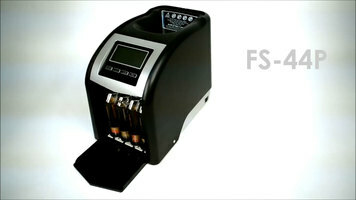 The Royal Sovereign FS-44P four row coin sorter saves you the hassle of counting change the hard way. Featuring a large hopper with an 800 coin carrying capacity, this counting machine is capable of counting over 312 coins per minute, and fills your coin wrappers for you, automatically advancing when complete!